Samoa 506300 Single Arm Budget Grease Hose Reel. The samoa 506 Series of single arm hose reels is a new concept in single arm hose reels with all the quality features of premium reels at an affordable price. Lightweight one-piece molded composite barrel assembly. Pressure cast aluminium arm and base for extra rigidity. Extra large 4 x 10mm long plastic ratchet mechanism and latch paul ensure a spark free and safe operation. Ceiling or floor mounting. 6.4mm ID x 10m capacity. Robust dual pedestal grease reel. Can be wall, ceiling, floor or tank mounted. 501300 10m x 6mm of delivery hose 0.8 metre long lead in hose. 504300 15m x 6mm of delivery hose 0.8 metre long lead in hose. Dual pedestal design provides additional strength and stability in harsh off-road conditions. Narrow width (21.6cm) enables space saving hose reel layouts. 15m x 6mm ID hose. This hose reel is setting a new standard for reliability and durability in the large capacity, heavy duty hose reel market. Corrosion resistant, easy to install and incredibly durable. 25mof 9mm ID grease hose. Powder coated steel with a single pedestal and integral spring system. 4 bolt heavy duty steel mounting plate. Multi position ratchet for positive latching adjustable guide arm – can be wall, floor, ceiling, pit or vehicle mounted. 15m x 6mm hose. 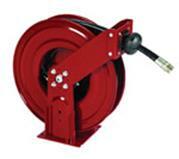 Heavy duty reels are ideal for truck mount applications. All spring rewind models have an external spring cartridge which allows cartridge replacement without removing the reel from its mounted position.